I just love these, a fabulous deep green and really nice underfoot. My only caveat: I've washed them quite a lot and I still get heaps of lint in the dryer. I suggest you put them through several half-hour cold dryer cycles to remove a lot of the lint before you first wash them. The Naples bath rug collection by Chesapeake Merchandising adds luxe comfort to any bathroom. We crafted this bath rug set with slightly contrasting colors to bring out the beauty of your coordinating design ideas. 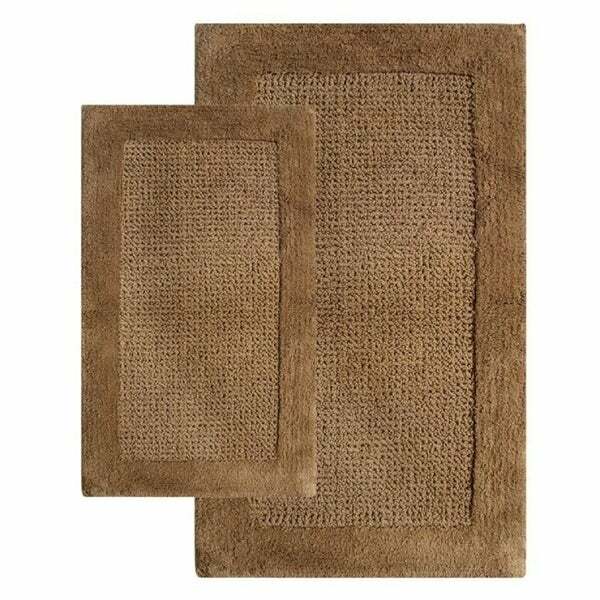 This bath rug set is all about elegant touches of color and plush softness. Our bath rug set is spun from 100% cotton, these bath rugs are incredibly soft and plush under foot, and their lightly sprayed anti-skid backing will keep them securely in place. The Naples rugs feature a simple textured and raised border design in multiple colors that are sure to coordinate with your bathroom decor. The 2 piece set Includes a 21" x 34" and 24" x 40" rug. Rugs are inexpensive and it shows. Backing comes off when washed and the rugs slip badly. Ends also tend to curl up. I ordered these in the peridot color for our nature inspired bathroom. The color is accurate to the picture and we love the more firm texture in the middle and soft on the outside. The only thing I noticed is that the rug slips around on the tile a bit and some of the sides are not a perfectly straight line, but nothing too noticeable. I like the rugs, they dont leave fuzz. I ordered the color "linen" and it is more tan than I expected but they are OK. They are soft and I would purchase again. Love these! They are thick, wash well and even vacuum up just fine! Beautiful color selection, too. Really nice quality, well made and over-sized which is nice. Product is very soft and thick material. Came in dirty, no rubber backing, was not impressed with the item. Returned. "Are these non slip mats?" "What are the sizes of these two rugs?"